Today marks the 27th anniversary of the famous Mount St. Helens eruption. At 8:32 am on May 18th, 1980 the volcano erupted as half the mountain slid off the side. 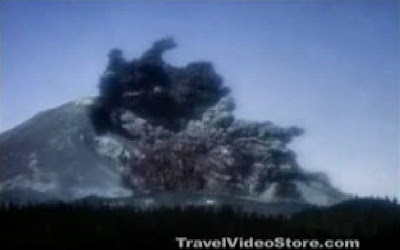 This GoogleVideo would not properly embed on the blog (and I can’t be bothered to figure it out), but if you click on the image below it will take you to the page where you can view that famous clip of the eruption. The geoblogosphere has had some discussions in recent months regarding the accuracy and quality of Wikipedia when it comes to geologic information. In this case, I think the Wikipedia entry on Mount St. Helens does a decent job at laying out the important information. And, as Wikipedia entries go, it has a very nice list of notes and external sites at the bottom of the page to get more information. 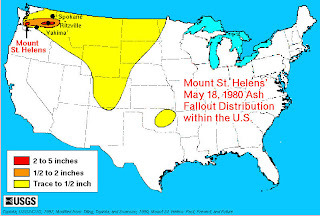 Below is a map of the ash fallout from the 1980 eruption. I wonder why there is that isolated patch in Oklahoma?